Hot on the heels of the recent announcement of a Haswell-E based mini-ITX motherboard from the main motherboard division of ASRock, the ASRock X99E-ITX, the server division has decided to release one of their own. One of the main complaints about the mainstream model was the reduction to dual channel DDR4 memory in order to fit everything on the board – however the EPC612D4I from ASRock Rack moves to SO-DIMM modules and elegantly fits one DIMM per channel within a 17cm x 17cm footprint for quad channel support. 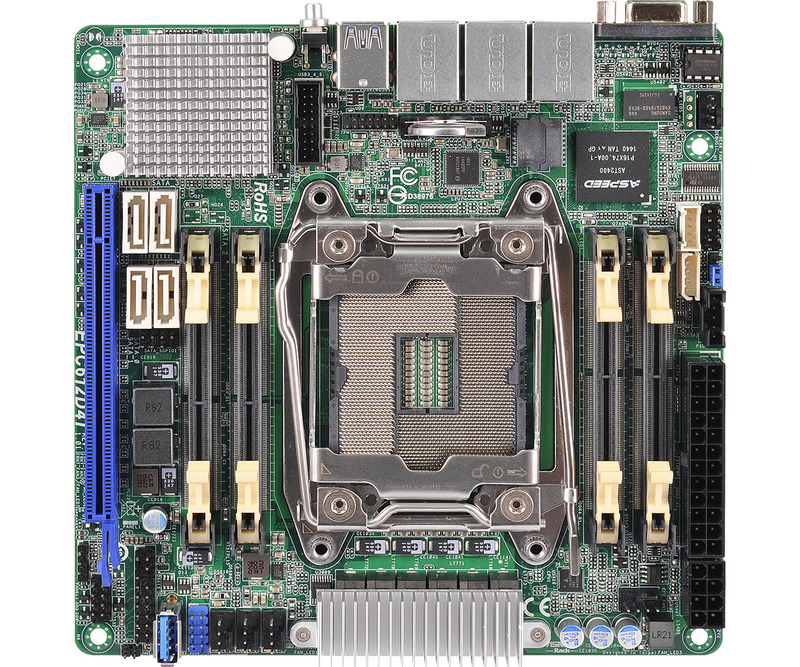 The motherboard uses the narrow ILM socket, usually found in the server space, similarly to the X99E-ITX. We also get a single PCIe 3.0 x16 slot, four SATA 6 Gbps ports, an integrated server control ASPEED 2400 module for headless running with KVM support and dual Intel gigabit Ethernet (I210 + I217). There is also an on-board USB 3.0 type-A connector for in-chassis USB devices such as dongle licences, and the rear panel is almost at the thin-mini-ITX standard for z-height. Notice that there is no onboard audio due to the space limitations. Sources of DDR4 SO-DIMM modules, especially ECC ones for servers, are relatively few right now. But because this is a server motherboard, chances are that the board is mostly available through B2B channels, athough we might see some consumer outlets start selling it later in the year similar to the C2750D4I. Also by virtue of server focused sales, chances are that the EPC612D4I will not come with a bundled narrow ILM cooler (like the X99E-ITX does) and users will have to source their own. The pricing reflects this, as we see that the price is reported to be at $265, making it a very cheap LGA2011-3 motherboard especially when we factor in Xeon and ECC support. Much like the X99E-ITX, ASRock is targeting the small form factor CPU compute markets rather than large GPU compute systems. We have the X99E-ITX in for review so stay tuned for that within the next few weeks. For VM and NAS purposes, the Avoton and Xeon-D platforms are just better-suited for small-scale or very large-scale deployments IMO. If you're going LGA-2011 for VM or NAS, you're usually going the whole hog and getting in a dual-socket board. it is a smart move ! if you unbox it and use the card inside the case and use that internal usb3 , and find a place to stick that board inside the case , you end up with a super usb sound card in itx case. 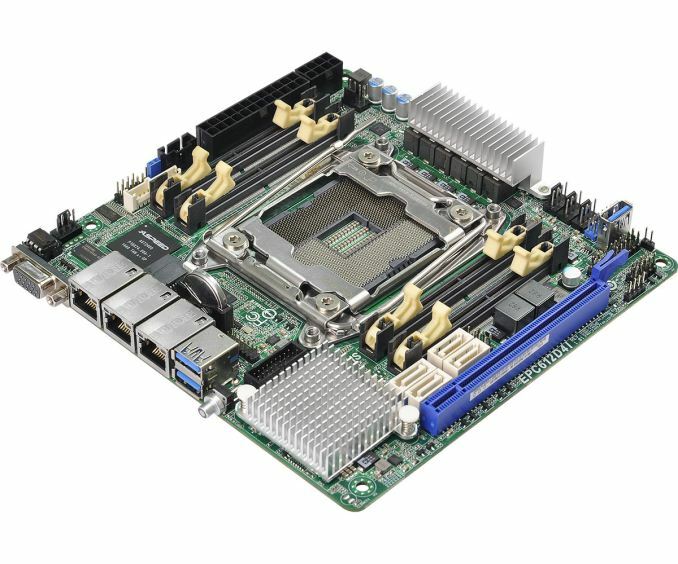 That's a neat design; does Asrock also offer cases which store lots of these boards in a rack-mountable form factor? It is irritating that the 17cm Mini-ITX board doesn't quite fit three across a 19-inch rack.